It's not particularly large, but provides refreshing dips. The pool is neighbored by two hot tubs, surrounded by comfortable lounge chairs, and serviced by a nearby alfresco grill and bar. You can laze and sunbathe in a peaceful setting because, unlike on some cruise ships, there is no loud poolside music or blaring PA announcements. And adolescent yelling and splashing won't disturb you because typically there are few if any children onboard. 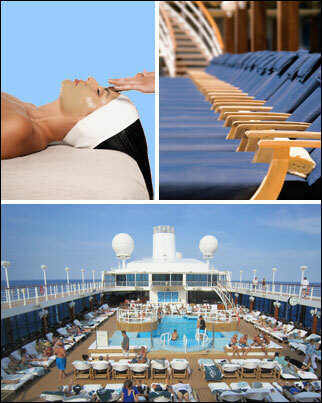 It offers a variety of treatments including facials, massages and dips in the open-air seawater thalasotherapy pool. The spa complex also has steam rooms and a men's and women's hair salon. The indoor gym has the basic equipment including treadmills, weights, step machines, and exercise bikes. There's also a separate aerobics room for group and individual use. That space is also used for yoga. And for joggers and walkers, there's an oval running track one flight above the pool area. for the cruise line's website.